It has been a couple days since I could blog so I will catch up on what you have missed. 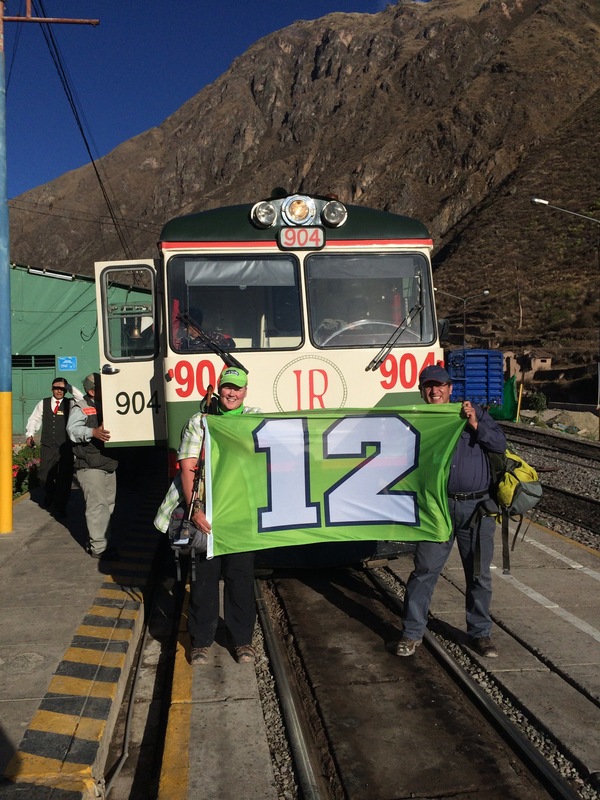 Thursday started with Julio arriving again and heading out toward the Sacred Valley. 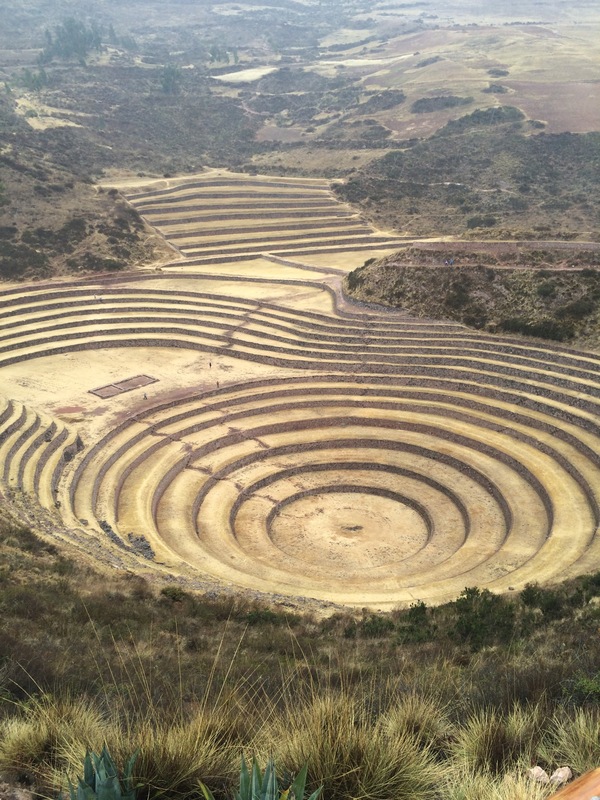 We went to Moray where there are a series if circles on terraces. The theory is that seeds were tested for flavor on each terrace to determine slight changes. It began to rain and as we walked down to the bottom it was really slick. Walking up was slicker yet!!! But I got to the top, the rain passed and we headed out to the salt mine. Now when I think of salt mines i think of deeeeep places in the earth and animals pulling carts of salt up to the surface. 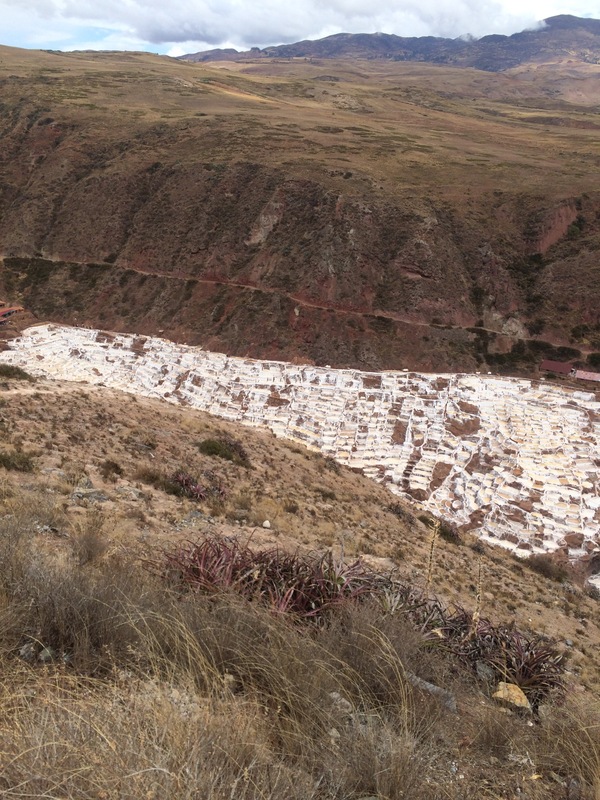 But this salt mine derives from a small spring that bubbles out of the side of a hill and people have little pools or sections to add wafer to, let evaporate and then scrape out the salt left behind. it was so cool and the people there are working so hard. It is a co-op and different people own the different pools. After the mine we had lunch of hamburgers and InkaKola and then it was off to the train where I bid farewell to Julio and headed to Agua Caliente! Posted on September 6, 2014, in Hiking. Bookmark the permalink. 3 Comments. It sounds to me like you got an amazing tour instead of a strenuous hike! Maybe you are the lucky one! I cannot help but be disappointed in myself for not getting to do the intended trek. But I was in a spectacular place with an amazing guide and got quite a bit of strenuous hiking in at my speed as a result. I guess I have an idea what people feel like when they climb a mountain but do not make the summit.